UC San Diego’s primary power system is designed for reliability and is recognized as a reliable, innovative example for others to emulate. The University's electrical utility system employs a similar design to systems used reliably at many other large California research universities, including UCLA, UC Davis, UC Berkeley, UC Irvine and Stanford. The campus is pursuing several power projects that, when completed, will enhance our ability to respond during any interruptions to the normal electrical power supply. These projects include enhancements to the Central Utility Plant, high-voltage power system, and fuel cell, as well as installation of additional automatic emergency power transfer switches. Facilities Management anticipates completing all projects by summer 2014. Bypass Stacks at Cogeneration Plant – Steam bypass stacks will enable more rapid starting of the Central Utilities Plant turbines if a power interruption occurs. PMU Monitoring System – Phasor Measurement Units (PMU) or Synchrophasors will monitor the SDG&E grid feed and notify the Central Utilities Plant of potential power interruptions, giving the campus an opportunity to reduce or transfer loads to minimize the potential effects of power disruptions. Resistive Load Bank on Fuel Cell System – The 2.8 megawatt fuel cell takes approximately 8 hours to restart if it trips offline. The resistive load bank will allow it to be restarted quickly if a loss of power occurs. 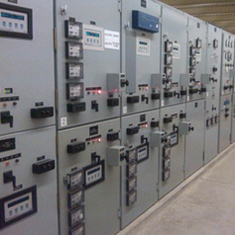 Automatic Substation Control System – An Automatic Substation Control System will allow the campus Cogeneration Plant to operate independently during an interruption or loss of SDG&E grid-supplied power. Normal high-voltage system maintenance requires periodic circuit switching; however, ongoing grid integrity/emergency power projects and new building construction have temporarily increased the need for electrical switching. The campus is connected to the SDG&E utility grid. Power is supplied to campus by three separate SDG&E feeders that merge at a single connection point at the East Campus Switching Station (ECSS). By having three separate SDG&E feeders supply power, a campus power outage will only occur when all three routes for power are interrupted. Although rare, this can happen as the result of a regional power failure or other catastrophic event. Redundant power feeds. 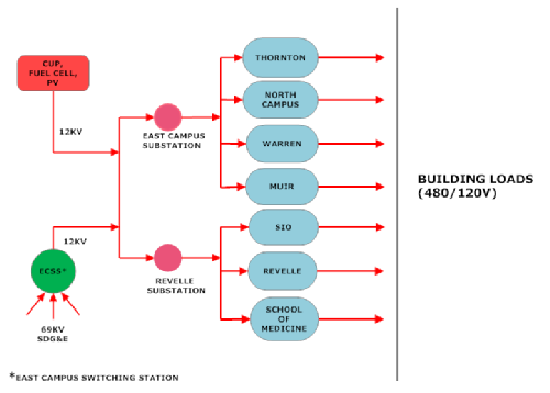 There are two electrical connections to each building on campus. Each electrical feeder is rated to carry the full load of the buildings in case one is not available. Most other campuses do not have this level of redundancy at the building level.. Emergency power is the power needed to support life-safety systems (e.g., emergency lighting, fire alarms) in the event of a power outage. All campus buildings have battery-operated systems or backup generators to supply emergency power for life-safety systems. Backup power, or optional standby power, is the power needed to supply equipment or systems whose failure will not impact life safety. Optional standby power is not required for all buildings. For more information, contact John Dilliott, campus energy manager, (858) 822-2807.